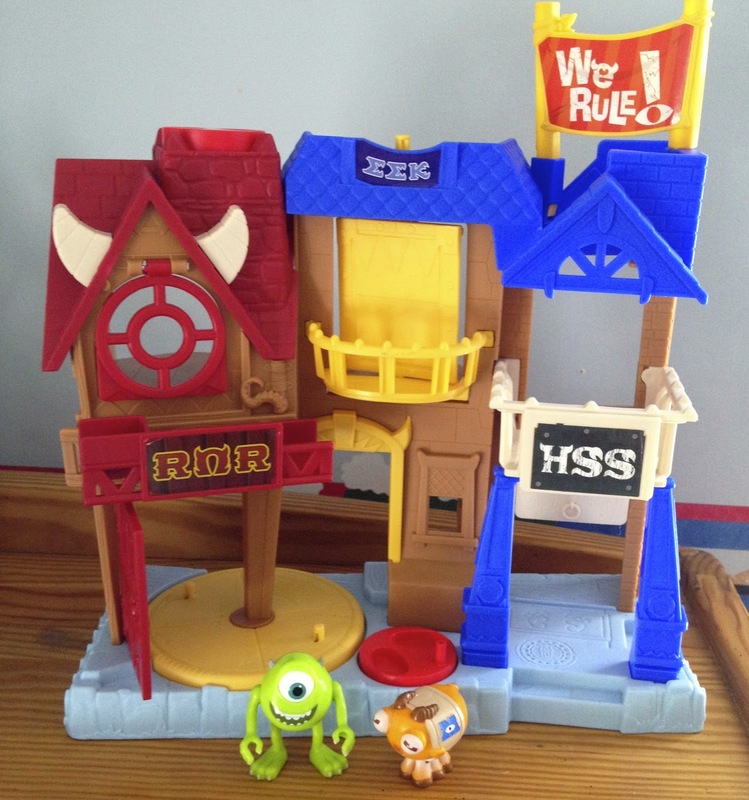 From last year's Fisher-Price Imaginext Monsters University line of toys, today I'm showing off the very fun "University Row" play set and the figures (sold separately) that were also part of the collection. 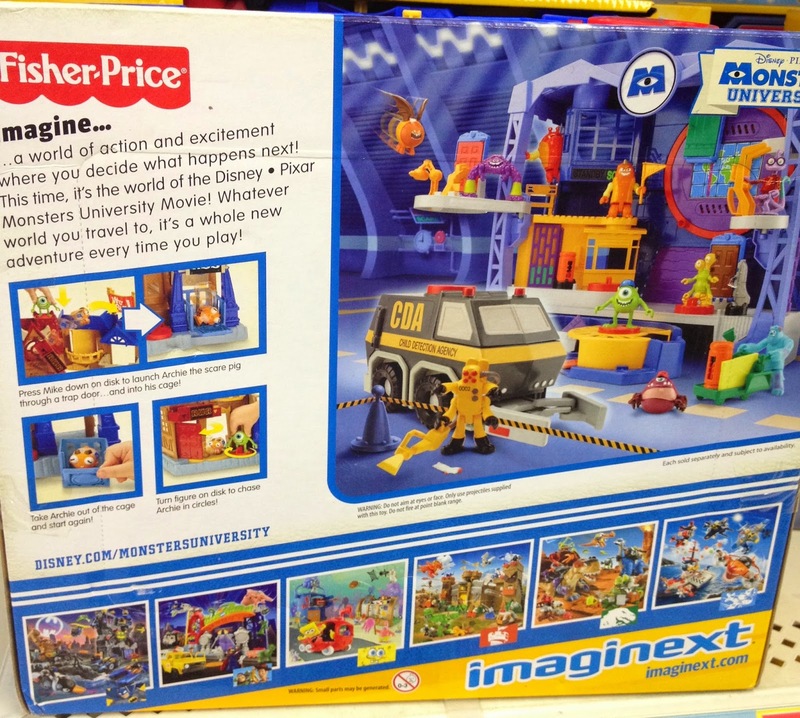 Imaginext toys are of course meant for very young kids, ages 3-8 years old and are full of sounds and play features. 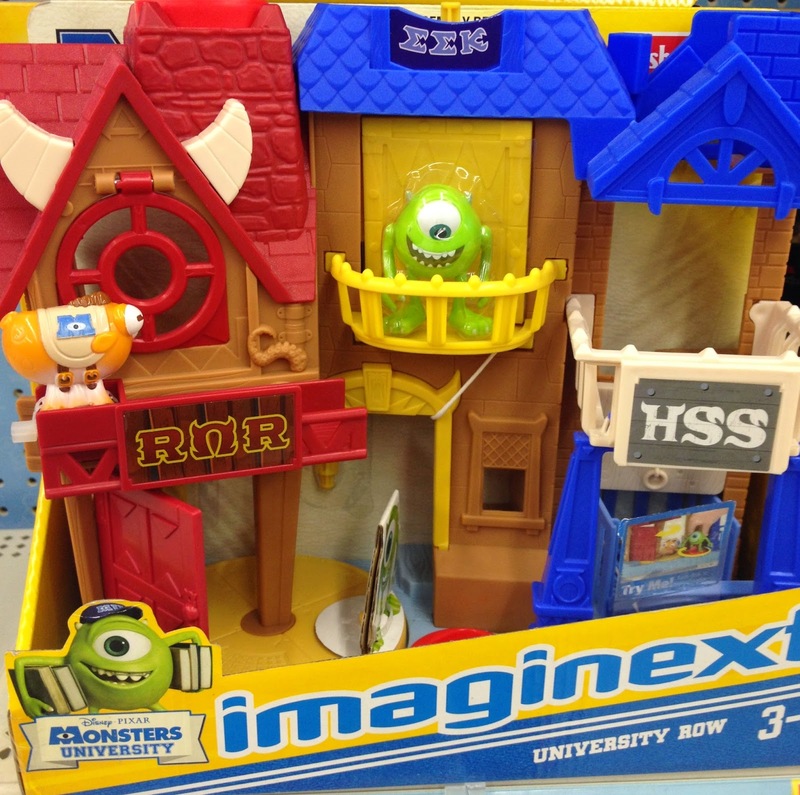 Lets first take a look at this MU play set below, which is based off of the fraternity and sorority houses (University Row) seen in the film. This set originally retailed for $29.99, but can now be easily found on sale for as low as $14.99. 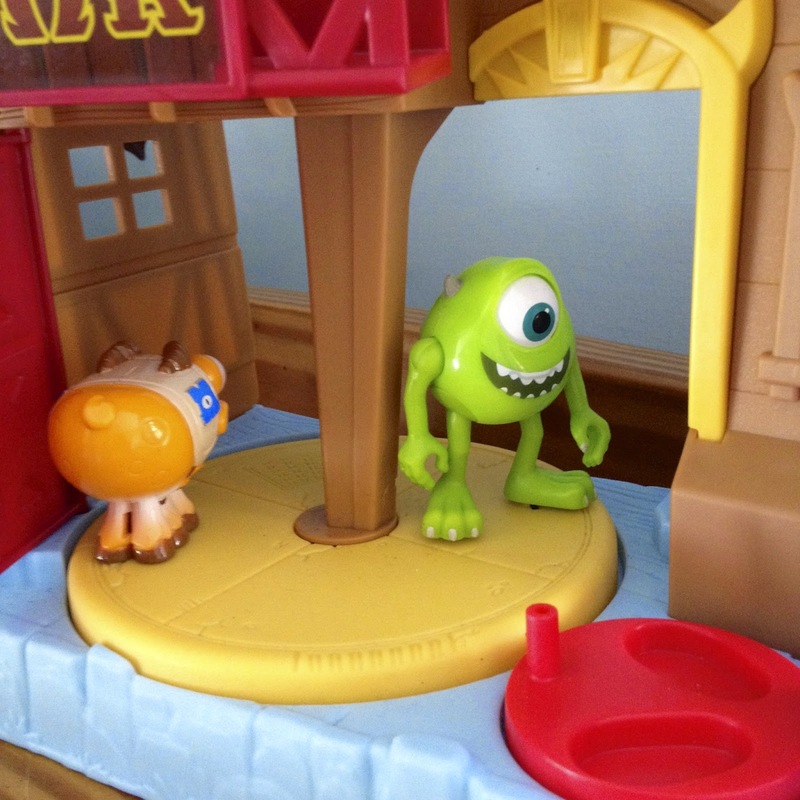 The set comes with two figures, Mike Wazowski and Archie the scare pig, to recreate the classic chase scene in the movie. 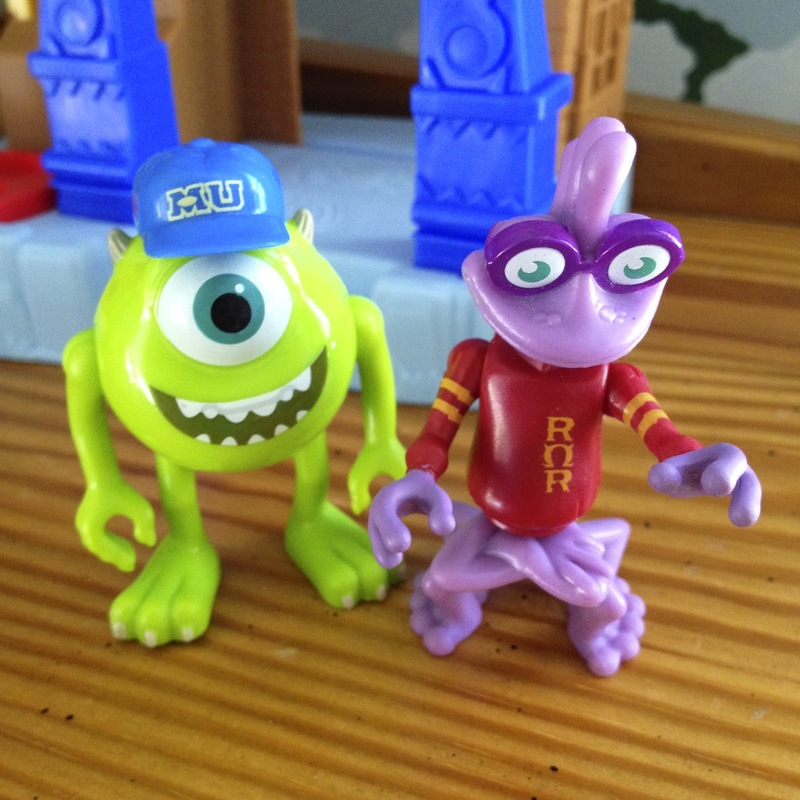 Mike is somewhat poseable (his arms, legs and even eye can move) while Archie is not. 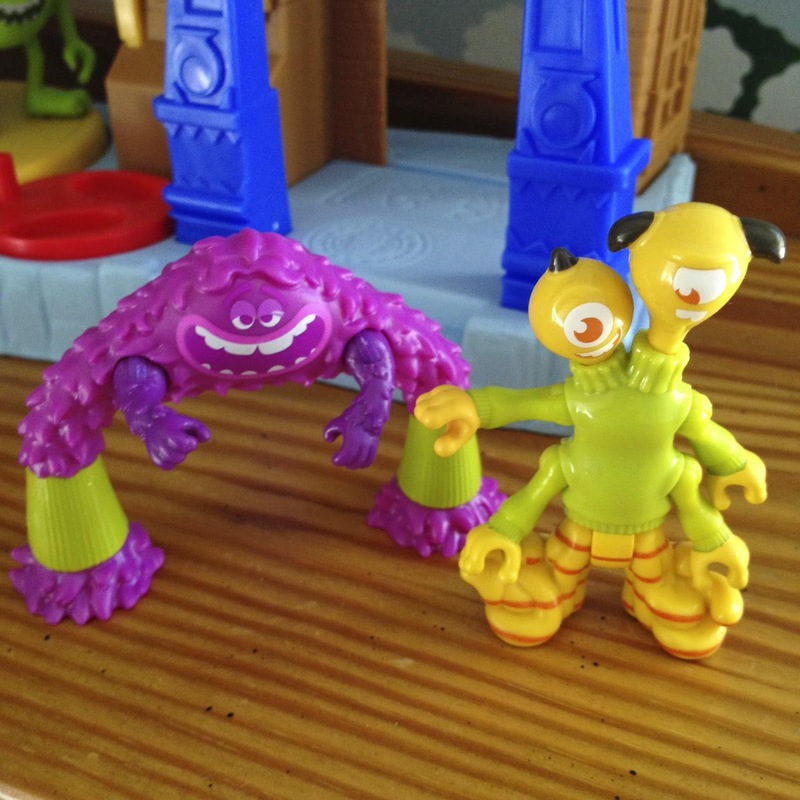 They are made of a sturdy plastic and have a great stylized look to them. 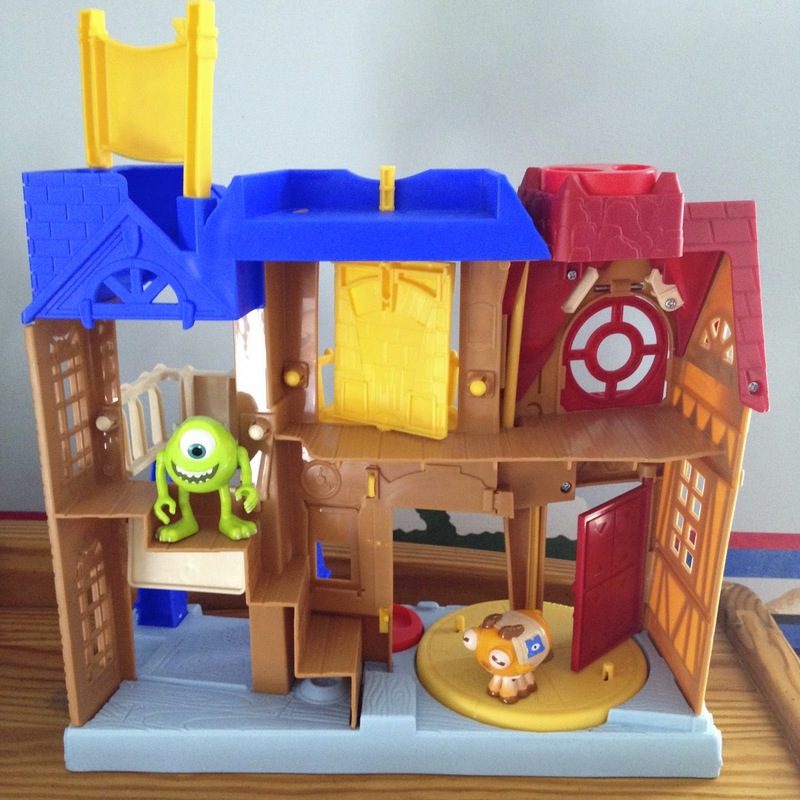 Place them on the spinning yellow platform (under the ROR house) and turn the red knob for "chasing action" and phrases from Mike such as "1, 2, 3 SCARE" and "I'm catching that pig" as well as Archie "oink/squeal" sounds. 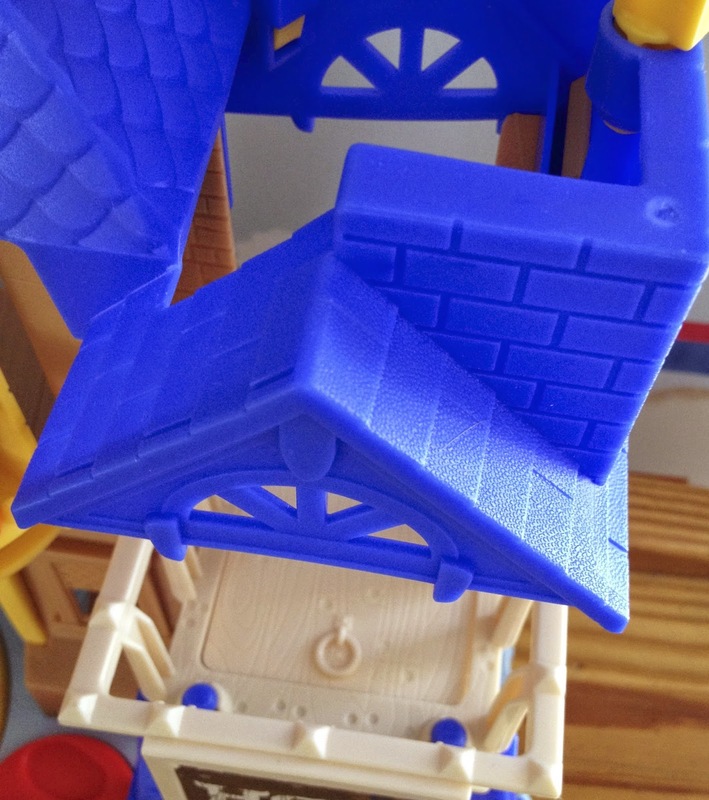 Another play feature: "Catch" Archie by placing him on the ROR "catapult" and press the red button on the top of the roof to send him flying through the air (with sound effects), through the HSS trap door and into his cage! Yes, in this set, pigs do fly. There is also a yellow revolving door on the balcony of the EEK house. 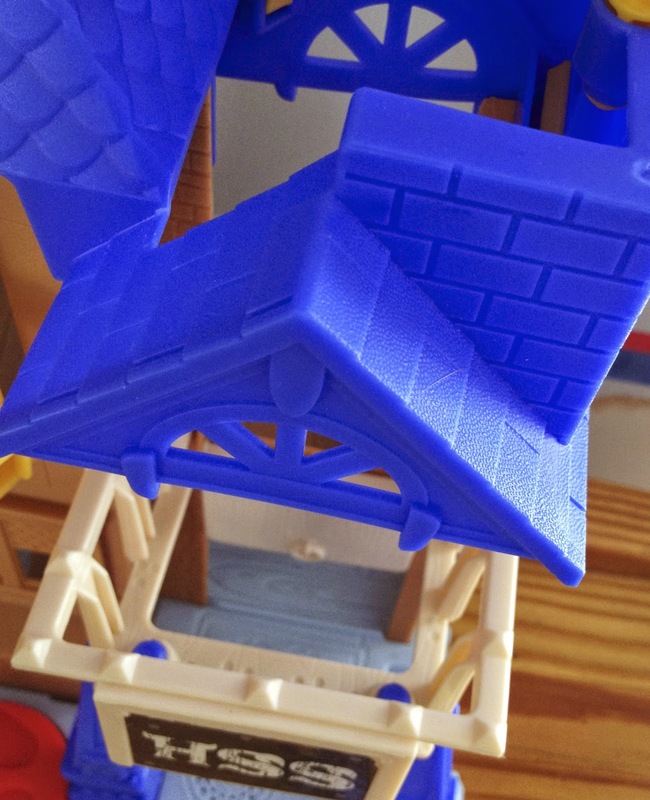 Continue the "chase" up there which leads to the back of the houses, complete with a staircase. 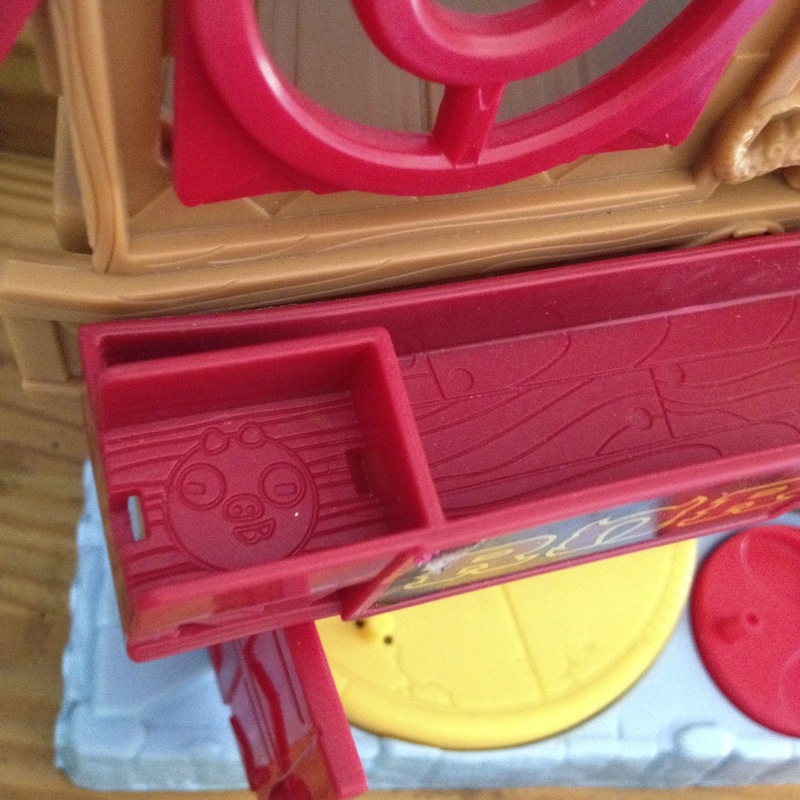 The red circular window to the ROR house also opens, giving Archie yet another escape route. 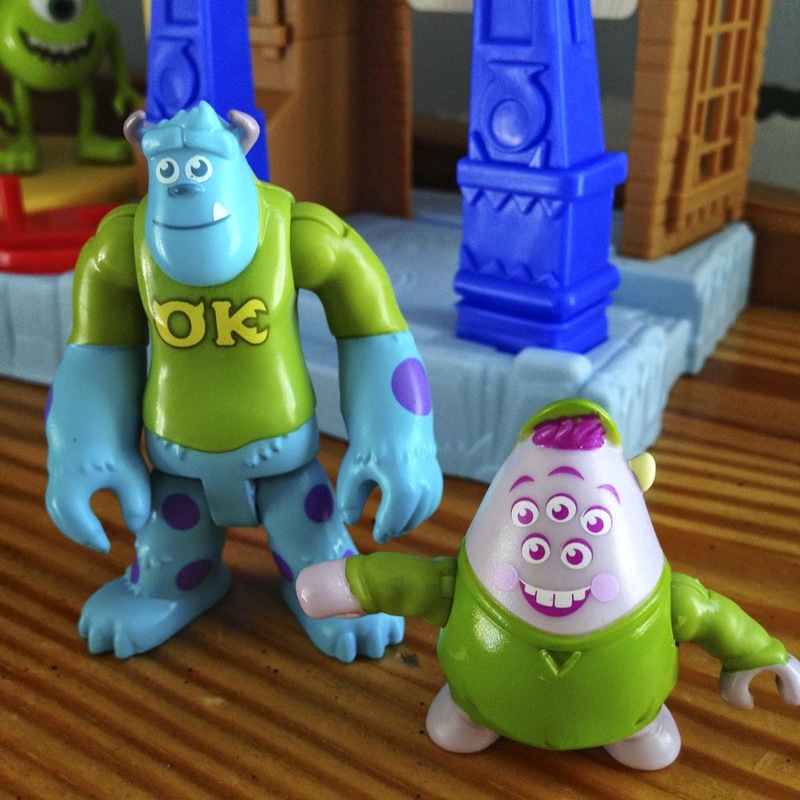 For a detailed look on how the play features and sounds work, visit THIS YouTube video by DisneyCollector to see it in action. 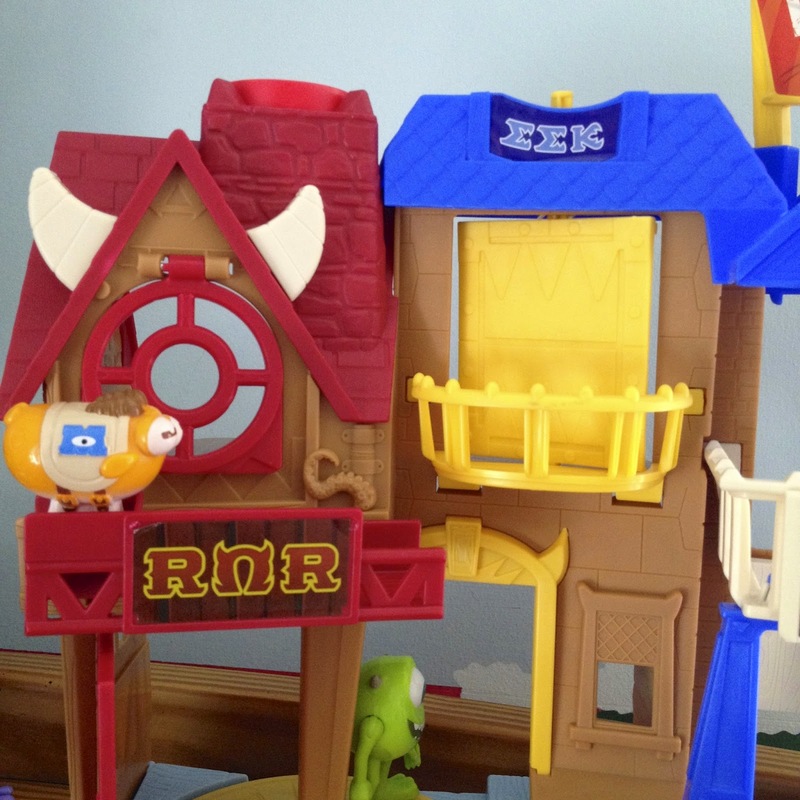 This is a fun, durable play set that encourages young kids to use their imagination. 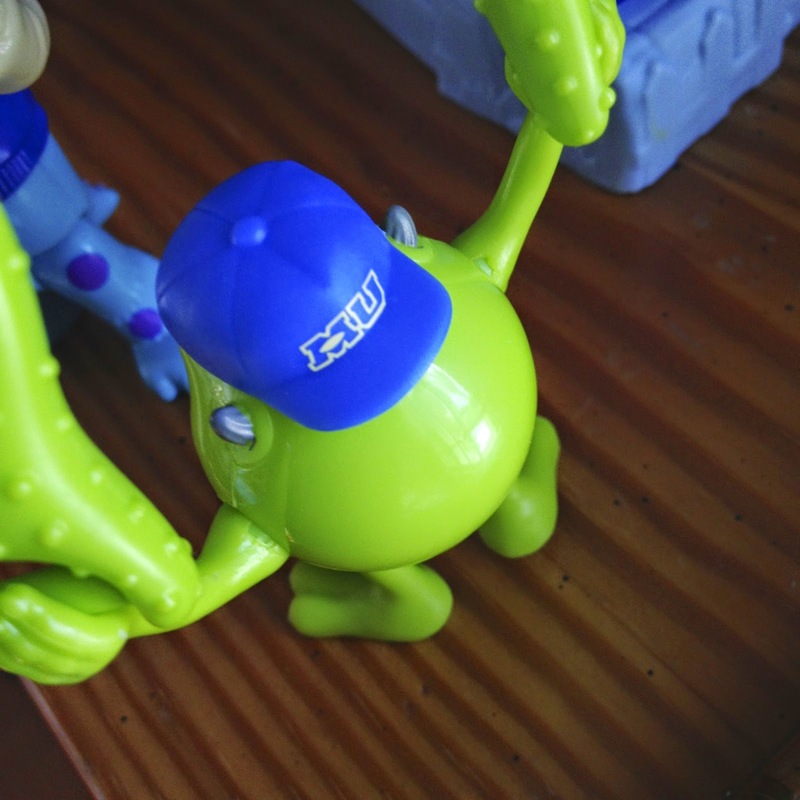 If you have a little Monsters University fan, I can't recommend this enough. I can't wait to be able to give it to my kids someday! 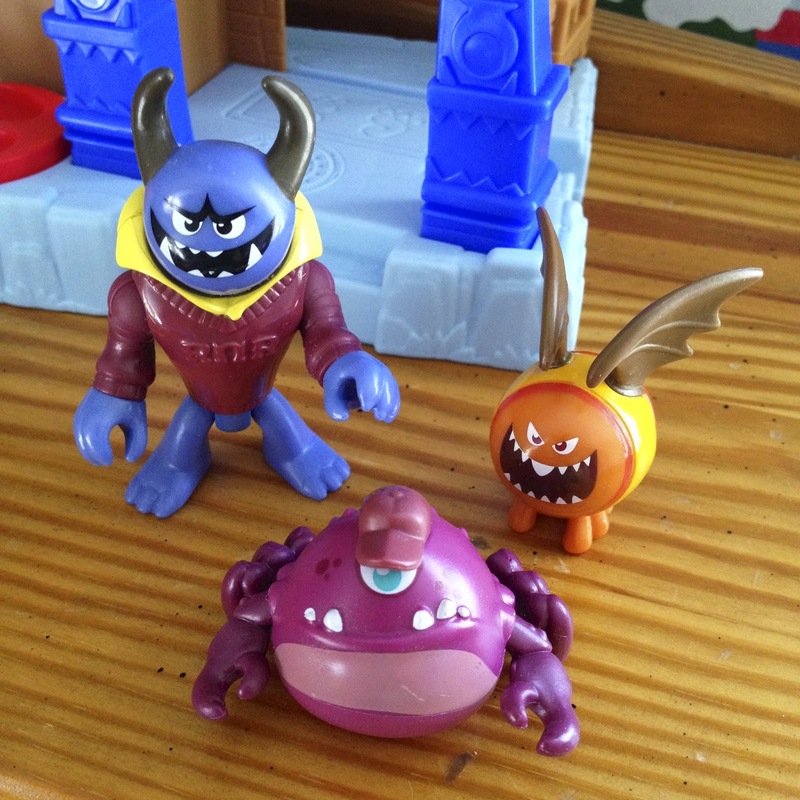 This set is still available at most toy stores or can be purchased on Amazon HERE. 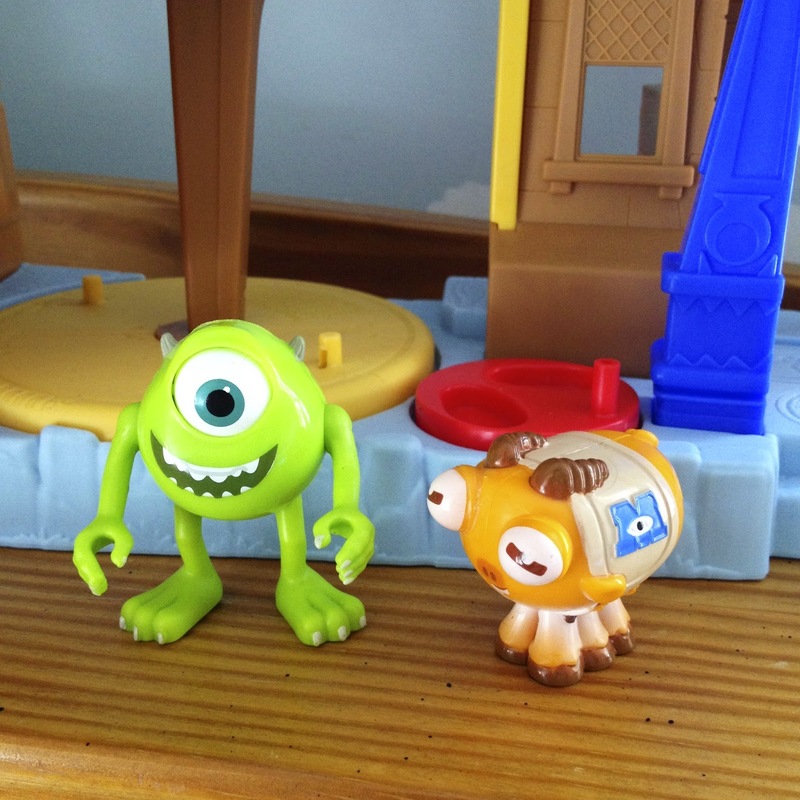 What play set would be complete without additional characters though? Exactly. 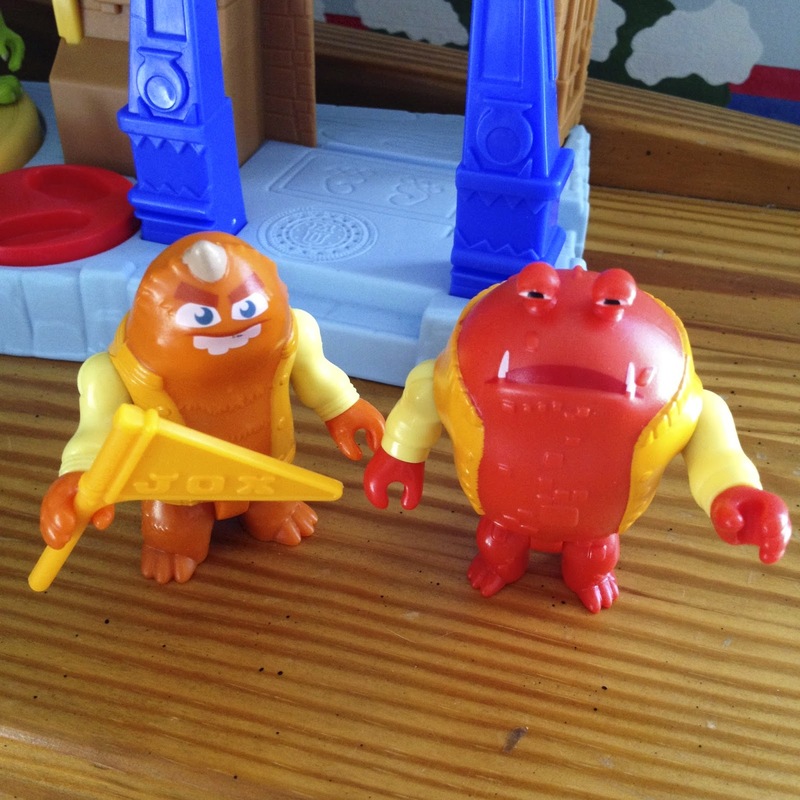 That's why I had to purchase the other MU Imaginext plastic figures which are sold separately in packs of two or three. 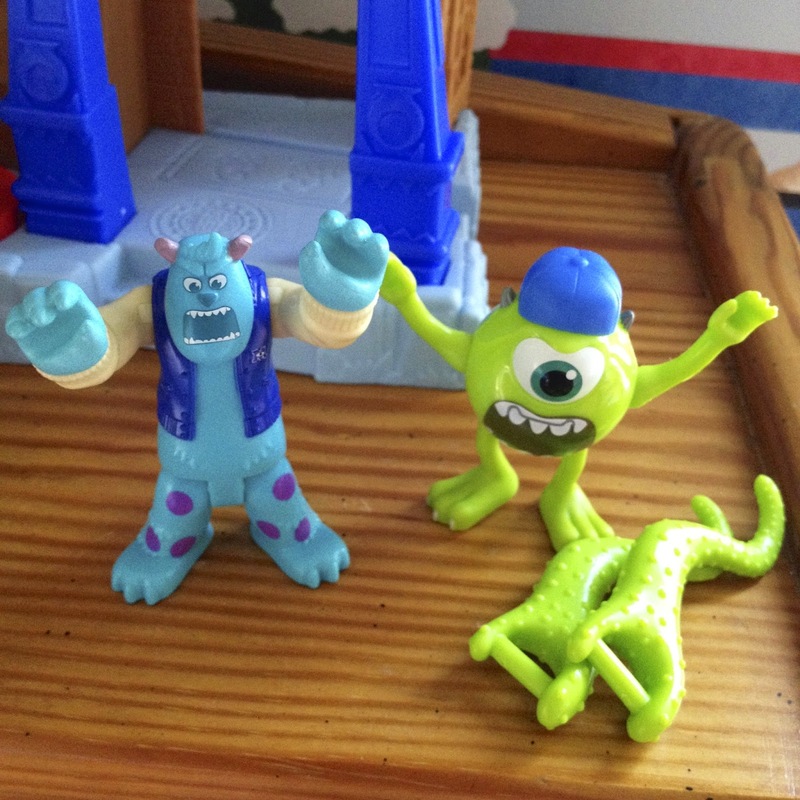 Like Mike, the figures are relatively poseable, but limited to mostly just basic arm and leg movement. The figure packs retail for typically around $8.99. There is one more figure set out there, featuring Art and Archie (with a cage), but I didn't feel the need to get it since I already have both those figures already from the above shown sets. If you are interested though, you can find it on Amazon HERE. 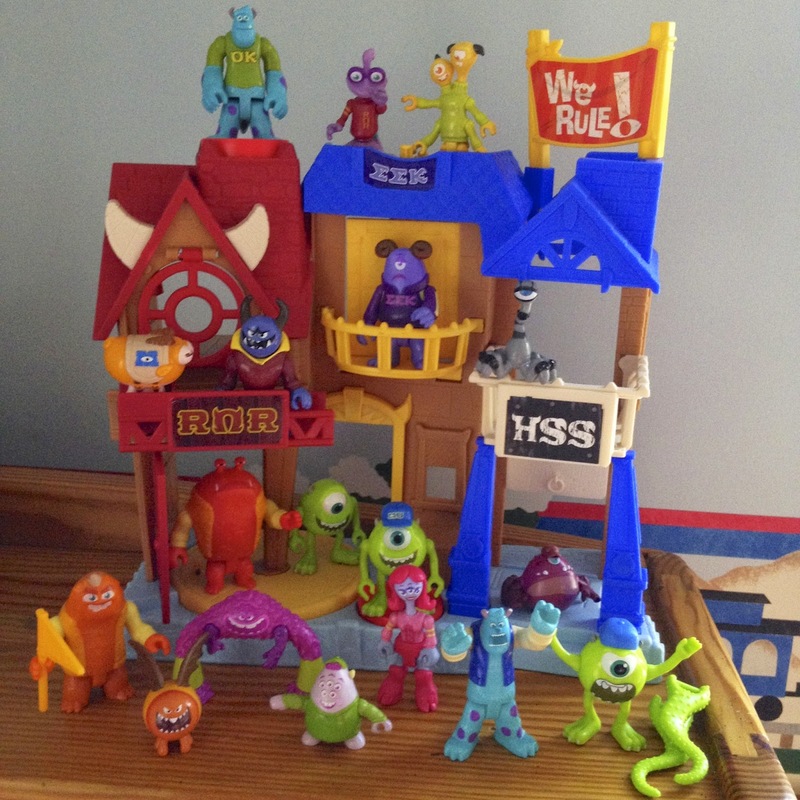 There we have it...a great play set and a great line of figures! That's not it though. 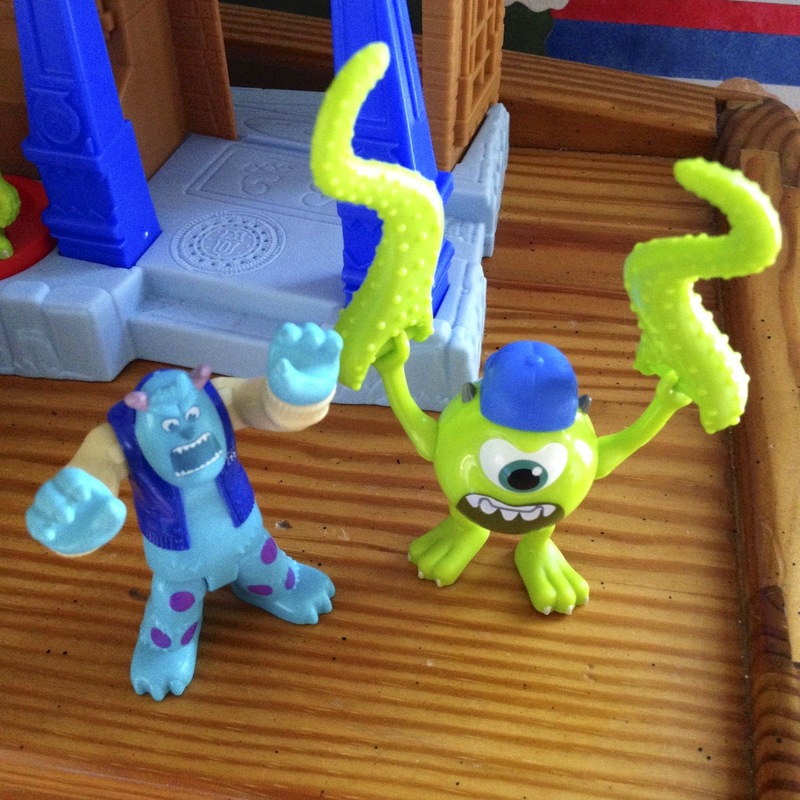 I've recently added a few more Monsters Inc. / University Imaginext toys to my collection so stay tuned as I review them right here within the next few days.